Avda. 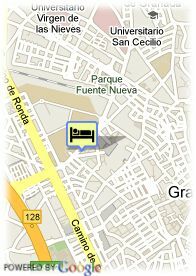 Fuentenueva, s/n, 18002 Granada, Spanje. 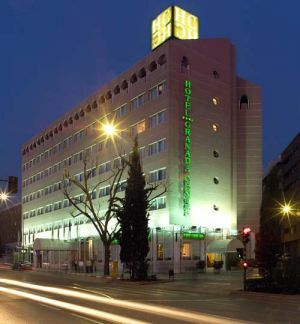 This 4* Superior hotel was renovated in September 2004 and it is located in the best centre in Granada, just a few minutes away from the shopping centre, the city's monuments and the Alhambra. There is easy access from the airport, a train station and a road network. It has 169 rooms, all of them exterior, which provide our guests with maximum comfort, convenience and cutting-edge technology. They have a minibar, telephone with an easy Internet connection (ADSL lines), satellite TV, complete bathroom with hairdryer, Pay TV, piped music, heating, air conditioning and free safe. Its excellent facilities include the 'Al-Zagal' a la carte Restaurant, a Bar-Cafeteria, an English Pub, facilities for disabled people, a private garage (optional) and four function rooms with a capacity from 20 to 250 people, totally equipped for holding any kind of event. Betalende overdekte parking aan het hotel (14.00 €), Reservatie verplicht.